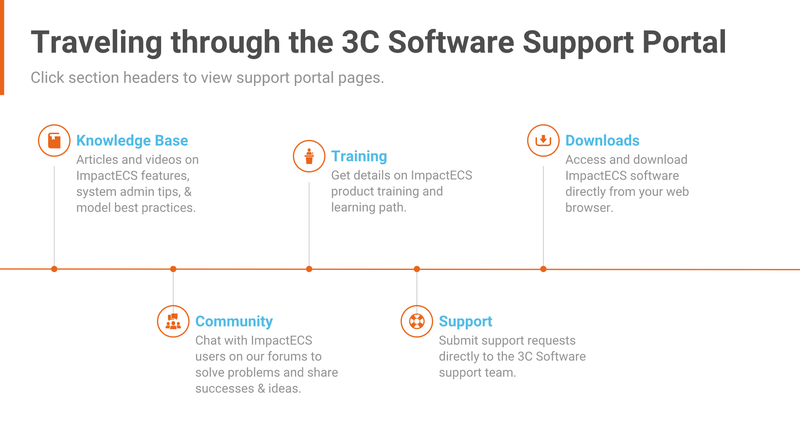 We’re excited to announce the launch of the 3C Software Customer Support Portal designed to expand our customers ability to access information, connect with other users, and get help with ImpactECS. Below is a quick overview of the main areas of the portal – the knowledge base, the community, training information, and access to support and software downloads. Current maintenance customers should bookmark portal.3csoftware.com to access the site using your existing ImpactECS credentials. Community: Connect with other ImpactECS users across geographies, industries, and experience levels to improve your cost and profitability capabilities. Knowledge Base: Check out articles on ImpactECS features, troubleshoot issues, and get ideas for new ways you can leverage ImpactECS in the knowledge base. Software Downloads: Access ImpactECS software is much easier with our new online product download interface. Just visit the Downloads section to view and download available software. If you’d like to request access to the 3C Software Customer Support Portal, please contact your company ImpactECS administrator for details. Have general questions? Feel free to contact our team at support@3csoftware.com or give us a call at 800-226-2036.